*HOT DEAL* Houdini Lever Style Corkscrew Wine Tool Stand - 63% Off! *HOT DEAL* Houdini Lever Style Corkscrew Wine Tool Stand – 63% Off! 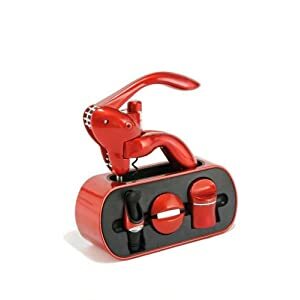 It’s the perfect time of year to entertain … and if you are wine drinkers, this is a great price for this Houdini By Metrokane Lever Style Corkscrew Wine Tool Stand! It’s currently marked down 63% and selling for ONLY $14.81! The price listed above was as of 11:01am CST on June 20th, 2012. Prices and availability subject to change. Make sure you confirm the purchase price prior to purchase. « GAP- 25% Off for 25 Hours Online Only Sale!